REHAU is preparing for key energy and district heating events nationwide this April, as it aims to convey its approach in achieving excellence within the industry. REHAU will join industry experts to showcase its strategy and discuss approach for sustainably managing energy resources today. They will also mention recent product innovations aimed to assist customers in achieving long-term energy, efficiency and affordability. 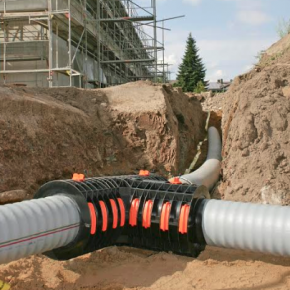 REHAU will be at the popular DMS seminar on Wednesday, 18 April in Manchester, where Karl Price from REHAU will give attendees a background to pre-insulated pipes for heat networks. This event will take place at the Rain Bar, beginning at 8.30am. A day later, REHAU will be at the Critical Power and Decentralised Energy event at Coventry City’s Ricoh Arena. REHAU will discuss its NEXUS product, which received a great reception as the world’s first hot tapping system for PE-Xa pipes when launched last year. Steve Richmond, Head of Technical and Marketing, Building Solutions at REHAU, will share his thoughts from 12.30 pm, including why hot tapping is a vital solution for expanding an existing district heating network. He will also discuss how the innovative NEXUS device achieves this, whilst offering significant time and money over conventional methods. Finally, on Thursday, 26 April, REHAU will be at the SECURE payment for District Heating event from 10.45 am to 1.45 pm. The event, taking place in Manchester at The Studio, comprises part of a series of free seminars happening nationwide, offering an in-depth discussion on District Heating and financial security from heating bills, in addition to the most talked about aspects of managing energy efficiently today. Talking about the trio of events, Steve Richmond talked about the excitement being felt. “District heating has become extremely popular over the last few years as it is deemed the next revolution in the way we deliver energy to our homes and businesses,” he said. “It is however important to understand how we can use energy more efficiently and the solutions and products available in the market that can help achieve this.